Presidential hopeful and former Military Chief revealed on Monday that two attempts were made on his life, confirming earlier reports of plots to kill the man largely responsible for the ouster of deposed President Mohamed Morsi. Sisi also vowed that if he is elected President, the Muslim Brotherhood would no longer exist. “Egyptians reject reconciliation with the Muslim Brotherhood,” declared Sisi when asked about the banned Islamist group, adding that the group is affiliated to violent extremists. “It is not me that ended the Muslim Brotherhood. You, Egyptians, are the ones who ended it,” added Sisi. While the former Military Chief is seen as the man who toppled Morsi and the Muslim Brotherhood, he said that it was not his intention to take power or run for President in July 2013. “Whoever has the opportunity to come and protect this country, the people and their future, has to come forward,” Sisi said, explaining that he decided to run for President because of the ‘threats’ facing Egypt. 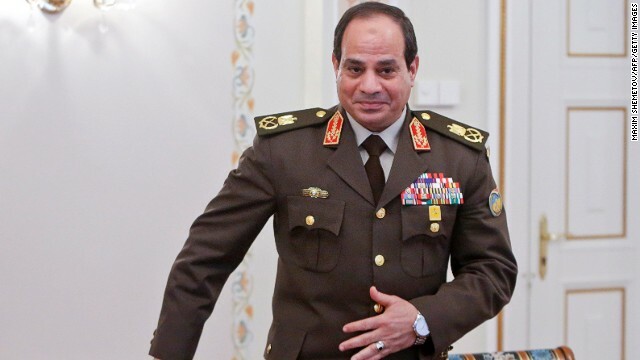 In regards to his status as a former Military Field Marshal, Sisi adamantly declared that he is not the military candidate. “I am not the Military candidate…the army will not have a role in ruling Egypt,” he said. Apart from Morsi’s one year-long Presidency, Egypt has faced a line of Presidents with military backgrounds, starting with Egypt’s first President Mohammed Naguib in the 1950s. The protest law has been responsible for the detention of thousands of detainees, including prominent activist and April 6 founder Ahmed Maher who was charged with protesting without a permit. Since July 2013, Egypt’s Military has been embroiled in a fight against militants largely based in the country’s North Sinai region. “Our borders are our national security…there were 1,300 tunnels, 1,200 have been destroyed,” Sisi revealed, adding that the Military will increase its presence to end terror in the Sinai if he becomes President. In his interview, Sisi described himself as an Egyptian Muslim who loves his country and will do all that it takes to serve it and protect it. The former Military general also added that he dreamt of a more tolerant Egypt, like one that existed several decades ago. 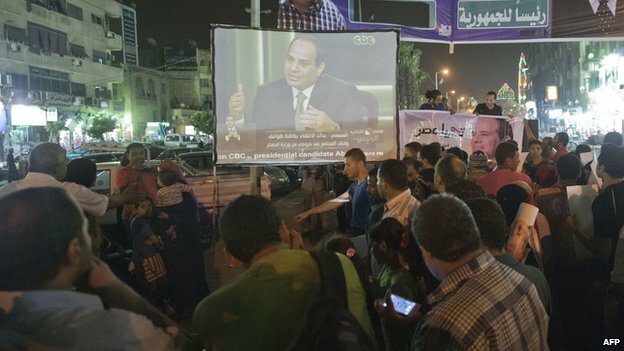 “The Jewish synagogue was beside us and I constantly heard church bells,” explains Sisi. “I never asked people about their religion,” he said, adding that Egypt was known for its tolerant atmosphere. Egypt’s Presidential elections will be held on May 26-27. Sisi is expected to easily win the elections, with his only contender Hamdeen Sabahi struggling to find greater nationwide support. The second part of Sisi’s interview, expected to touch upon health, the economy, education and more, will be aired on May 6 at 9PM local time.